The Romans Road is comprised of Six Pillars of Truth drawing from a group of six verses from The Book of Romans. If you walk down this road you will arrive at an understanding of how you can be saved. If you hover over the verse reference to the right of each of the 6 truth statements below, the verse will appear in a window, or even better, let me encourage you to grab a Bible and dig into the verses that way! If you’d like to take a step of faith and receive Jesus as your Savior then here is a suggested prayer you can pray right now to enter into a new life with Jesus Christ fully forgiven and secure! This prayer does not save you but it’s a way to help you confess and receive in faith God’s Free gift of Salvation! 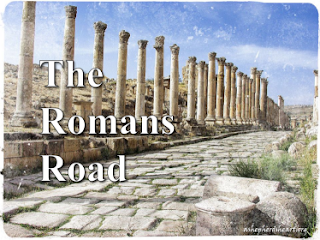 The Romans Road....this is a pathway you can walk, right now! The Question is – will you walk it? If you’ve already walked The Romans Road and have received Salvation, praise God! Now go and share The Romans Road with others who have yet to walk this road! I'm praying for you! May you listen to God's voice as He draws you to Himself either in salvation or day-to-day as a follower of Christ as He guides and directs your path.